Implant surgery can be carried out using either a one-stage or two-stage procedure, depending on your particular clinical circumstances. In either case, the surgery involves making a small incision in the gum to expose the bone and using a special drill to shape the implant site.In the one-stage procedure, the implant is fitted into the prepared bone and then an attachment called a healing cap, which protrudes through the gum, is placed over it. This healing cap is removed after a 3-6 month period and replaced with a permanent attachment called the abutment, which takes the form of a post and core. 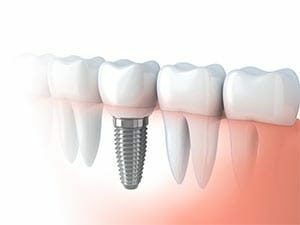 The replacement tooth, or crown, is cemented in place over the abutment.In the two-stage procedure, a cover screw is placed flush over the top of the implant and the gum is sewn up over it for the period of healing. A second procedure is needed to uncover the implant via a small incision in the gum and attach the healing cap. Then, after the gums have healed, the healing cap is removed and replaced by the abutment, in readiness for the new crown.Two-stage surgery may be necessary if there is a need to increase the quantity of bone at the site with a bone graft or a bone regenerative technique. There are a number of reasons why there might be a lack of bone at the implant site, including long-term missing teeth, denture wear, and bone loss from periodontal disease, ageing or injury. When teeth are missing, the surrounding gum and underlying bone shrink away over time. This is because, in health, the presence of our teeth stimulates the natural turnover, or renewal process, within the bone.